May 31, 2014 was a life changer and one of the worst days of my life. I was shot in the chest by a single shot bullet sending me to the trauma unit, unresponsive for 12 hours, literally dead. But by God’s grace and mercy he saved my life. When I woke up after all the operations and procedures, the doctors came in the room and delivered the news telling me where the bullet had hit my spinal cord and that I was going to be paralyzed from the chest down and wasn’t going to be able to walk again. From that day forward my life changed for the better and I thank God for saving my life and giving me a second chance to get it right. Being in this position has opened my eyes to realizing my purpose and reason for being here. God has given me this vision to start a nonprofit ministry because MY purpose in life is to inspire, encourage, pray, minister and motivate people who are going through similar disabilities, confined to wheelchairs, beds, and to the ones who feel like there is no hope in life and feel like giving up on life. My assignment is to share my life story and let them know how I get through my down times and who helps Me get through my trials and tribulations and my day to day obstacles. 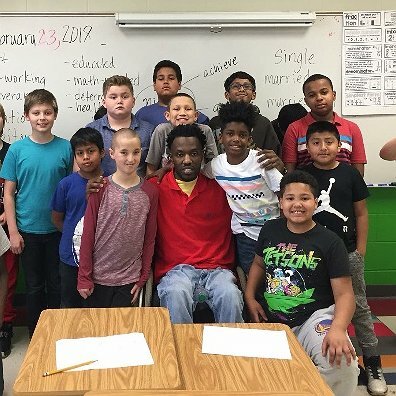 My main objective is to reach out to this younger generation and to spread my story and sit them down and take one on one time with them and get to know them personally. This ministry is for everyone. Everybody is more than welcome to participate and get involved with your positive input and your life story that will help someone else, because two heads are better than one. It’s about loving and helping each other. Each one teach one out of love. I’m excited about this vision God has given me, and with your help, I’ll be looking forward to meeting and working with you guys. Be blessed. Cortes Randolph. Family and friends of Cortes Randolph are raising money for the nonprofit Help Hope Live to fund uninsured medical expenses associated with Catastrophic Injury. Cortes has chosen to fundraise for Help Hope Live in part because Help Hope Live assures fiscal accountability of funds raised and tax deductibility for contributors. Contributors can be sure donations will be used to pay or reimburse medical and related expenses. To make a tax-deductible donation to this fundraising campaign, click on the Give button.